Click here to dowload The Faculty Voice, Volume 2, Issue 1, March 2019. In the 10 months since Doug Ford has become Ontario’s Premier, his attack on post‑secondary education has been unrelenting. Let’s review some of his actions to date. One of his very first orders in office was to terminate the College Taskforce that Arbitrator William Kaplan had awarded college faculty out of the 2017 strike. The taskforce, which included representation of all stakeholders and experts, was intended to address many systemic problems in the college system, including the extreme overreliance on precarious faculty and an ineffective governance model that excludes academic voices. OPSEU has launched a challenge under the Canadian Charter of Rights and Freedoms, arguing that this was a violation of our bargaining rights. In fall 2018, the Ford government then proceeded to repeal Bill 148, the Fair Workplaces, Better Jobs Act, which mandated better working conditions and fairer wages for contract workers, including paid personal emergency leave (PEL) and the same rate of pay for contract and full-time workers. As a result of the repeal, contract faculty in Ontario colleges, who are already some of the lowest paid in the country, are facing a rollback of the modest wage gains they made through the equal-work-for-equal-pay legislation. The repeal of Bill 148 also stripped away PEL benefits and axed the $15 minimum wage that would have brought great relief to thousands of our students who rely on part-time jobs to put themselves through school. In August 2018, the Ford government announced that all post‑secondary institutions must implement a new free-speech policy by January 1, 2019. Colleges Ontario quickly jumped on board with the government’s directive and proceeded to develop a policy without the involvement of a single faculty member and only one student across the province. On the surface, implementing a policy to protect free speech on campus sounds like a good thing. However, in practice, the policy is backwards, threatens to punish students who protest on campus, and limits the speech of certain employees. Faculty’s newly won academic freedom protection, set out in Article 13, continues to protect us, and any attempts by the college to limit our speech inappropriately will be met with grievances and provincial condemnation. Most recently, Ford announced a 10 per cent tuition cut without replacing those funds with any additional operating revenue. This will leave an $80-million dollar hole in the colleges’ operating budgets and will undoubtedly be used as an excuse to cut services and increase reliance on precarious work. While Ford touted this as making education more affordable, the tuition cut was paired with a deep cut to the financial grant system. The net effect is that post‑secondary education will be much more expensive, especially for college students who rely on the grant system most heavily. To make matters worse, the so called “Student Choice Initiative” has made funding for student unions optional. This will result in the mass slashing of programs run by student unions and will severely limit students’ ability to advocate for a better system. And, of course, if the government is attacking the rights of student unions, how long will it be before they come after labour unions? Together, these provincial directives spell disaster for the quality of post‑secondary education in Ontario, which already has the lowest funding per student in Canada. However, we are also seeing the emergence a new social movement to fight for higher education as a fundamental right. Faculty, support staff and students are standing together like never before to demand a well-funded, quality system. We encourage all faculty members to follow these developments closely and reach out to their local to discuss ways they can get involved in the fight for education. RM Kennedy is chair of the OPSEU College Faculty Divisional Executive and vice president of OPSEU Local 558 at Centennial College. In January, it was the post-secondary sector’s turn to feel the sting of Doug Ford’s contempt for working people and young people when his so-called “government for the students” slashed funding for colleges and universities by almost half a billion dollars. At the same time, his government kicked free tuition to the curb. This latest hit to post-secondary funding will overload classrooms bursting at the seams and further erode the quality of our students’ education, already recklessly compromised by the chronic underfunding of the previous Liberal government. That had college administrations scrambling to make up the funding gap by engaging in financially and ethically questionable enterprises. College professors are educators. No government should “fully anticipate” – in Minister Merrilee Fullerton’s words – that colleges are “capable and able” to come up with magic revenue sources to compensate for the government’s irresponsible and shameful underfunding. The 10 per cent reduction in tuition fees will only benefit the already well-off. It will do nothing to help students from families that struggle to make ends meet. The reduction in non-repayable OSAP grants and the elimination of free tuition will make post-secondary education much less accessible for these students, running directly counter to any efforts to eliminate the cycle of poverty. But Ford’s revenge on students, few of whom have any love for him or his agenda, didn’t stop there. Stooping even lower, he made certain ancillary fees optional, thereby cutting the legs from under student unions and the vital services they provide to students. This measure has nothing to do with reducing students’ financial burden and everything to do with trying to silence the voices that critique and resist the Ford government’s unjust, inequitable and fundamentally dishonest agenda. Ontario’s future is at grave risk. The province’s prosperity is in direct proportion to the quality and accessibility of its post-secondary system. For a few dollars saved now, this blinkered government will lose out on billions in additional tax revenue generated by an economy fuelled by an abundance of well-educated workers – the kinds of in-demand workers that investors are looking for. Autism services have been gutted. Full-day kindergarten is under the gun. Schools have been ordered to stop hiring. Post-secondary education has been broadsided. The College of Trades has been torpedoed. As much as Bill Davis was the education Premier, Doug Ford is the anti-education Premier. It’s up to us to be the anti-Ford educators. It’s up to us to ensure he’s kept on academic probation until finally expelled in 2022. It’s been just over a year since we won important new language in our collective agreement giving greater job security to partial-load faculty. The language in Article 26.10 has resulted in the development of a partial-load registry at each college. How is the registry presently being managed? Unfortunately, the answer to that question is uncertain. To know if qualified partial-load faculty are being given hiring priority when courses are assigned, each local needs access to information: the names of registered partial-load faculty; the most up-to-date number of service month credits possessed by each of those registered faculty; what courses they have previously taught, etc. This information should be readily available to locals, such that the local can provide timely responses to questions from partial-load faculty about their employment status. 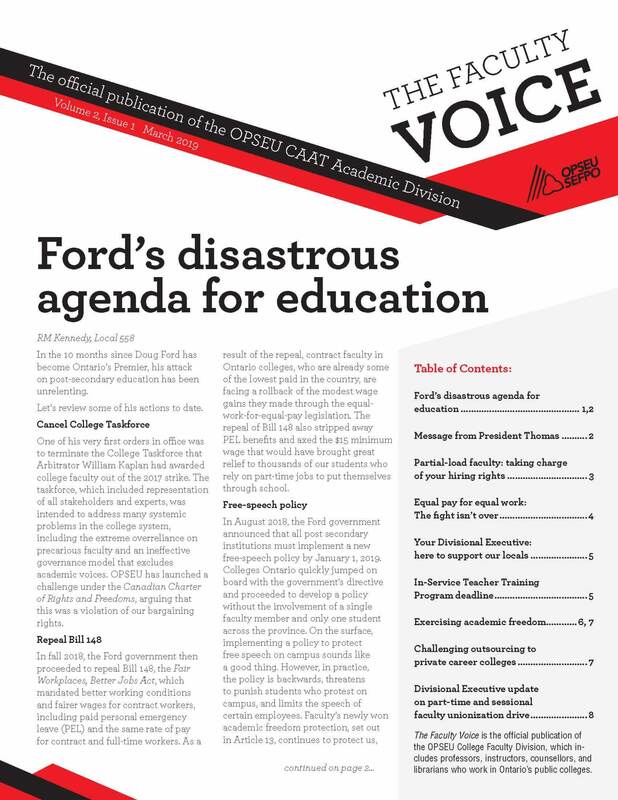 While a few colleges have co‑operated, many have failed to do so, and thus OPSEU has filed several non-compliance grievances against the colleges. While these grievances are awaiting arbitration and settlement, locals are working with individual faculty to ensure (where possible) that their job security rights are being protected. If you believe you have not received a contract to which you are entitled, you should reach out to your union local for advice. If a course is to be offered in partial-load status, the partial-load faculty member with the most seniority who has previously-taught the course should be offered it first, as long as they don’t exceed the 12-teaching-hours-per-week limit. Under the registry, there may be reasons why the college decides not to hire a partial-load position. For example, poor enrolment may result in courses or sections being cancelled, leaving fewer teaching hours for faculty. Or a new full-time position has been added to the program, resulting in fewer hours for contract faculty. However, if the college did not hire a qualified partial-load faculty member simply to bypass the registry, such an act is in bad faith, and locals should challenge such actions. You would have no access to the college-paid extended health benefits. If the time between partial-load contracts is greater than 6 months, waiting periods for benefits will apply. Your service credits would not be recognized (will not add to your seniority). You would have no paid sick days (although some colleges, like Humber College, have committed to continue to offer part-time faculty two paid personal emergency leave days). Your pensionable service is reduced. Your vacation pay may drop from six per cent to four per cent, diminishing your overall hourly rate. With the growing number of contract faculty in our system, it is imperative that all partial-load faculty advocate for their hiring rights. For starters, find out what information exists in your registry profile, including the number of service credits and previously taught courses. As an employee, you have the right to this information. Should you find yourself in a situation where you feel the registry was not properly followed, take this information to your local – sooner rather than later. Among the many poor decisions of the Ford government regarding post-secondary education was the introduction of Bill 47, the Making Ontario Open for Business Act. This bill repealed many of the gains introduced in the Wynne government’s Bill 148, which had updated the Employment Standards Act and Labour Relations Act, including the introduction of equal pay for equal work, public holiday pay, and personal emergency leave days for all workers, regardless of full-time or part-time status. The gains under Bill 148 had been one of the key demands in our last round of negotiations and had provided a foothold toward equity for contract faculty. Indeed, arbitrator William Kaplan included language in his award that enshrined both a joint union-college committee on implementing Bill 148 in our collective agreement within a year, as well as a provincial task force to address precarious faculty work in the college system. Throughout 2018, the Bill 148 committee met to address how to implement equal pay, vacation time, benefits, personal leave and other issues to include unionized contract faculty. The outcome of these discussions would set a bar for a first contract for currently non-unionized contract faculty as well, should the organizing drive be successful. Some of these faculty also began to pursue complaints with the Ontario Labour Relations Board around equal pay for equal work. While our discussions at the Bill 148 committee table were, at times, contentious, the colleges did begin to take steps in the right direction, raising non-unionized contract faculty wages to the same level as unionized partial-load faculty (although the union’s position is that all contract faculty pay should be prorated to full-time faculty pay). We had not reached agreement on this issue and had been clear from very early on that we wanted to refer this issue back to Arbitrator Kaplan. The College Employer Council preferred to wait and see what the Ford government would do to gut Bill 148 and reduce their obligations to the majority of their faculty. CAAT-A persisted, and we have a date with Arbitrator Kaplan in April to present our case and seek a decision on these outstanding issues related to Bill 148. Similarly, we are involved in two ongoing constitutional challenges about the back-to-work legislation that ended the strike in late 2017, as well as the Ford government’s cancellation of the provincial task force. Although these are slow processes, these key issues of fairness and quality remain live and active for the provincial leadership. We are not done yet – in some ways, we are at the beginning of this fight. While this government continues to introduce legislation to eviscerate public education and health care on a number of fronts, resistance is growing, and we are having successes on the ground. We are optimistic about our chances of pushing back through arbitration and the courts and will keep you posted as developments arise. Building strength as a union is important at every level and begins with our locals. Strong local leadership is critical for mobilizing, educating and enhancing our division. With a number of our locals experiencing changes in leadership, we recognize the value of sharing experiences and wisdom with those who are taking the reins. In the fall, with the support of OPSEU, I had the privilege of visiting Local 613, Sault College, to assist their new president and local executive committee. I was so impressed by the passion and energy of the group and delighted to be able to help answer their questions, bring provincial updates, share some best practices from my local, and get to know these hard-working advocates. We also met with Local 613’s OPSEU staff representative and discussed educational support that the regional office is able to provide. Since the trip, Local 613 is doing very well addressing the myriad issues college faculty continue to face. Whether you are a local with new leaders or a seasoned group in challenging times, as your DivEx, we are here for you. Your DivEx members are available through email and phone, or if you prefer, arrangements can be made to visit your college or attend your general membership meeting. Locals are encouraged to contact their DivEx liaison at any time with questions or concerns. Together, we are so much stronger. The deadline for registering for the In-Service Teacher Training Program (ISTTP) is quickly approaching. If you or any other full time faculty are currently not eligible to reach Step 21 on the salary grid, consider registering for this program. Completion of this program will allow faculty to reach Step 21. However, after August 31, 2019, no new registrations will be accepted, as the program has been discontinued. For more information on the program, visit St. Clair College’s website. Academic freedom, found under Article 13 of the collective agreement, focuses on the freedom to teach, to question (“inquire, investigate and pursue”), and speak out about academic issues without fear of reprisal. With regards to our right to speak out, we can break it down to speaking out within our college community, say, at a meeting (intramural) or in a more public context, as in giving an interview with a local paper (extramural). Academic freedom is a broad and complex right that post-secondary faculty across the world exercise. It defines what it means to be an academic. This article focuses on five areas in which Article 13 can have an immediate and positive effect. a. Academic freedom means that faculty can speak out about academic issues without fear of reprisal. This is known as “protected speech,” and it is supported by some of the strongest case law related to academic freedom. b. Protected speech can include making statements critical about your employer. c. This speech can be internal to the college, such as sending critical letters to management (even including the college president). d. This speech can also be external to the college, such as publishing a letter in the local newspaper or in another public forum. f. Protected speech can be used to point out the academic impact of poor management decisions concerning staffing, program management, academic policies, workloads, etc. g. Protected speech is made more powerful if faculty in a given area come together to make collective statements about issues of common concern. Academic freedom includes the freedom to teach. This involves choosing what evaluation methods are used. There is already a process in the collective agreement under Workload, Article 11, specifically Articles 11.01 E2 and 11.01 E3, for faculty input into evaluation methods. Academic freedom bolsters a faculty member’s judgment under 11.01 E3. Conflicts over evaluation can thus take place through the Workload Monitoring Group (WMG) process, with academic freedom as a support, or as an Article 32 grievance, grieving Article 13.
a. There is also strong case law to support a professor’s right to choose their own course materials. b. In a conflict between faculty and management over what textbook or other course material is to be used, an Article 13 grievance can be filed with a high likelihood of success. c. However, the rationale being used by a faculty member to use or not use a given resource must be academic in nature. As always, strong arguments have a better chance of winning. a. An increasing concern in the colleges sees managers changing faculty grades for no academic reason and against the professional judgment of faculty. b. Academic freedom supports the right of faculty to assign grades and for having the academic judgment of professors stand. c. This means that managers cannot change faculty grades in an arbitrary manner. d. Grade changes can only occur through an academically justifiable procedure, such as a formal grade appeal process. e. College administrations have also created policies whereby an administrator may grant a supplemental evaluation to a student after final grades have been entered. This is superfluous to the grade appeal process and should be monitored so that it is not applied in an arbitrary manner. a. Academic freedom is an exercised right that faculty should not be afraid to debate and discuss with colleagues and managers. This is especially true when considering method of delivery. When faculty have academically sound reasons for specific methods of delivery, bring it forth in meetings with your manager. b. For example, direction from a manager requiring that an evaluation must be given online is within the purview of academic freedom. c. As with other academic freedom issues, faculty will argue that a manager’s decision violates Article 13 if the decision overrides a faculty member’s sound academic judgment in a manner that is arbitrary or in bad faith. Academic freedom is not just for university-educated professors teaching in university-style courses and programs. It applies equally to faculty in the trades and in other applied and occupational programs. The core principle is the same: The faculty member teaching – whether sociology, nursing, plumbing or massage therapy – is the expert in their respective field. Their expertise is the bedrock of quality in post-secondary education and needs to be respected. Article 13 will only be strong to the extent that we are willing to use it. Faculty should be actively and creatively trying to look for ways to utilize and expand our academic freedom. This article is by no means an exhaustive list of how academic freedom applies to our members. For instance, academic freedom can also be utilized by counsellors and librarians. This will be the subject of a further article. Academic freedom involves changing the culture of college education – away from a manager-centred model focused on corporate priorities, and toward a faculty- and student-centred model focused on the quality and integrity of education. We don’t have academic freedom unless we exercise it! So let’s continue to talk about these issues and scenarios, bring them to the attention of our colleagues and union stewards, and finally bring them forward as grievances. If we don’t defend our academic rights, it’s not just our working conditions that suffer – it’s the quality of our students’ education that worsens! Six of Ontario’s public colleges currently have problematic partnerships with private colleges to deliver public college credentials to international students. The formula goes something like this. The public college (usually from a more remote area in the province) enters into a revenue generating licensing agreement with a for-profit, private institution. The private institution then delivers the public college’s programs to international students in urban areas at inflated tuition rates. The public college gets undisclosed revenue from the private college and in exchange, the private institution gets to use the curriculum, institutional recognition and branding of the public college. In addition to paying drastically higher tuition fees, the international students earn their credentials in subpar classrooms, with little access to the student services and supports that regular domestic students receive. Although the curriculum and graduation diploma are both branded with an Ontario public college name, the curriculum is taught by independent contract workers hired by the private colleges. The working conditions of these contract workers are far below the standards for partial-load faculty with respect to pay, benefits and academic rights. How, then, can we expect these international students to receive a quality education in such a system? After a damning report in early 2018 showed that these partnerships carried unacceptable risks to public colleges and students, the previous Liberal government decided to phase them out. However, the new Ford government appears to have reversed this decision. As we continue to lobby the provincial government to change their outsourcing regulations on international student education, two locals – at Canadore and St. Lawrence – have filed Ontario Labour Relations Board applications regarding employee status, claiming that the workers (support and faculty) teaching and working in these programs belong in our bargaining units. These support workers and faculty are hired to deliver public education programs to students graduating from a public college. Bottom line? That means they are public sector employees. On January 30, 2019, OPSEU announced that a tentative deal had been reached for part-time college support staff after almost one year of negotiations. Over three years in the making, our 20,000 part-time support staff colleagues are finally unionized employees, working under a collective agreement with union rights and represented by OPSEU. The process faced constant legal challenges by the College Employer Council (CEC), causing this delay. Part-time and sessional faculty began the same journey one year after our support staff comrades. In October 2017, faculty cast their votes on whether they would like to unionize. As expected, the CEC is once again obstructing the desire of our colleagues to unionize with legal challenges. The result of this action is a waste of public money that should be directed to frontline services and quality education. Minister Merillee Fullerton could order the CEC to drop its opposition with the stroke of a pen and put millions of taxpayer dollars – currently filling lawyers’ pockets – into frontline college education. The Ford government, the CEC and the colleges are trying to prevent access to justice, but OPSEU is committed to ensuring it isn’t denied! Click here for bargaining highlights.